KAREN VIBERT-KENNEDY/Sun-Gazette Elm Park in the city along West Fourth Street in Williamsport on Wednesday. Elm Park, long known as the place for watching baseball and softball games, will retain that sports theme if city officials permit sale of the land to become a modern athletic complex. By this time next spring, the potential exists for a $6 million complex at the site, which runs along West Fourth Street across from Memorial Park and Bowman Field. 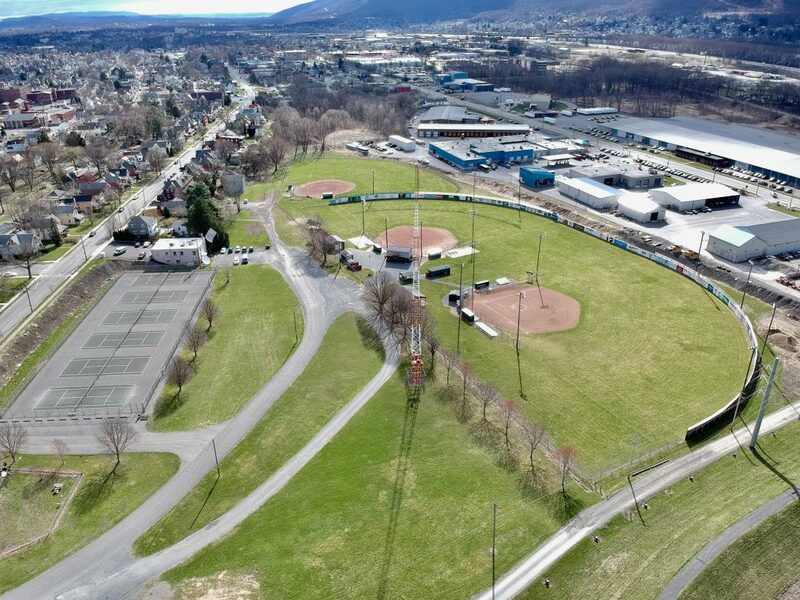 The Williamsport Sports Complex, a name subject to change, would consist of five artificial-turfed fields for collegiate, high school and tournament softball and baseball games. “We have a draft sales agreement with the city,” said Jason Fink, Williamsport/Lycoming Chamber of Commerce executive director. The property’s been appraised at $90,000. The chamber is willing to spend $200,000 to assist in costs the city has to relocate the tennis courts. “We’d be starting with a blank canvass,” Fink said, explaining how this won’t be a resurfacing of the existing softball fields, but rather, a redone complex with artificial turf instead of grass, some bleachers and a media center. The deed indicates it must be for public open spaces from the perspective of recreation, Fink said. The largest field will be 365 feet, a collegiate-size field, to centerfield, while others will be 220 feet to the centerfield. In comparison, Bowman Field centerfield fence is 411 feet, said Gabe Sinicropi, a spokesman for the Lycoming County Visitors Bureau, an affiliated partner in the project with the chamber. “We have had conversations with Pennsylvania College of Technology and with Lycoming College,” Fink said. Penn College, Williamsport Area School District and St. John Neumann Regional Academy use the fields currently to play softball, he said. Lycoming College is exploring the possibility of a men’s baseball team, Sinicropi said. The difference with the proposed sports complex is the field surface won’t be grass but rather artificial turf, which allows for earlier and late season play and less maintenance. “There is no need for a tarp,” Sinicropi said. In the spring and summer rains, you let it drain,” he said. A marketing survey indicated strong interest and the potential for visitors to spend weekends for tournaments is there, Fink said. From a business end, the colleges will have a choice facility whereby they may entice prospective athletes in softball and baseball, Sinicropi said. The plans don’t impact Original Little League fields or the Lifland Skate Park. It is hoped the complex, the potential tournaments and its proximity to Memorial Park amenities will spur further development. For example, just to the east of the proposed sports complex, is land owned by Keith Eck. A representative for Eck has been aware of the proposed plans, Fink said. Eck is anxious to see it be used for commercial and retail purposes, Fink said.